Are you doing everything that you can to grow your company – or are you merely operating it instead? As many of today’s chief executives can relate, it’s easy to fall into the trap of reacting to growth challenges to stay afloat and survive. 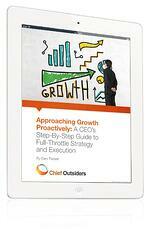 Download Gary Fassak's eBook, “Approaching Growth Proactively,” to better understand how to have a proactive approach to achieving growth in your business, people and culture. As our Chief Outsiders’ principals Art Saxby and Pete Hayes assert in The Growth Gears, a logical, market-based perspective and approach to growth is the best way to capitalize off your company’s present and future opportunities. Ready for growth? Fill out the form to download my ebook. Feel free to contact Gary directly at GFassak@ChiefOutsiders.com if you have any questions or want more information.